Yet again. This garden near my house is so beautiful these days, with the purple flowers on the ground and all, that I couldn’t resist to shoot there once again… plus, I had on my flower printed shorts and the colours matched my blouse, so it seemed the outfit was meant for the place. That being said, my life has not been that idyllic lately just because my final exams are this month, so a lot of work is required. I guess this is how I always say goodbye to you now, but since it is oh so true here it is again: off to studying now! Much love. Outra vez. Este jardim perto de minha casa está tão bonito, com as flores lilases no chão, que não consegui resistir a fotografar lá mais uma vez… Além do mais, estava com calções florais vestidos e as cores combinavam com a blusa, tudo perfeitamente em harmonia com o ambiente. Dito isto, a minha vida não tem sido tão idílica quanto isso porque os meus exames são este mês, o que requer muito trabalho. Parece que é sempre assim que me despeço por estes dias, mas como é tão verdade aqui vai outra vez: off to studying now! Muitos beijinhos para todos. que linda * gosto muito dos calçoes 🙂 e o cenário é inspirador !! Wonderful pics! You look gorgeous! wow!!!! Amazing colors and outfit!!! Love everything!!! Im your new follower! tao bonitas fotos! adoro a ultima! WOW I love the look! And you look really pretty in the pictures! thanks for your lovely comment 🙂 i love these photos, so beautiful! love your cute shorts! and usually i'm not a fan of wicker bags..but yours is actually really cute! Beautiful shirt!!! the outfit looks amazing!!! Opá! Tão giro como a blusa combina com as florzinhas no chão! Realmente é um paraíso 🙂 já não passava aqui há algum tempo mas adorei os últimos looks! Love the shirt! I want it! lovely photos! 🙂 that place looks great! I love that you paired the shorts with a sleeved top!You look lovely! wonderful fotos , like ! Me encnata el look y unas fotos preciosas. Obrigada pelo teu comentario no meu blog. Esse jardim é mesmo lindo! 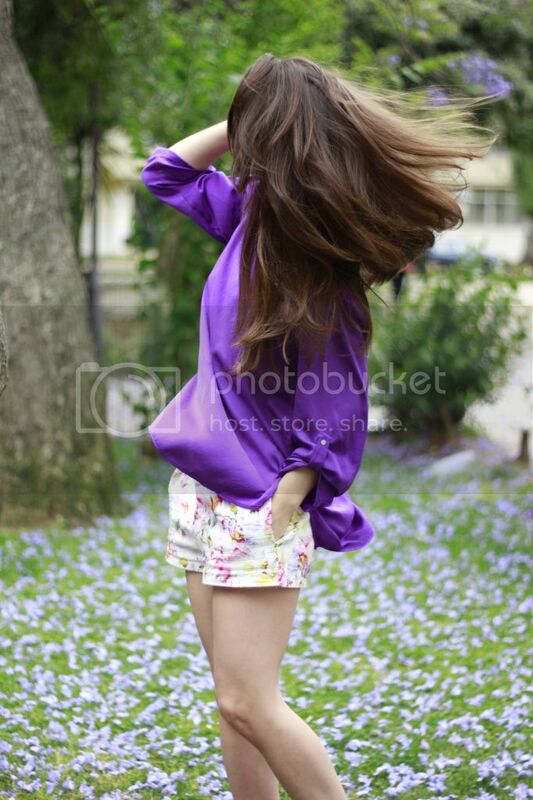 Very lovely look and pretty blouse and short! Love the colours! It's incredible! stai benissimo e le foto sono stupende!! Such a gorgeous vibrant shade of purple, the top looks so nice with the shorts! Also the garden is such a beautiful backdrop! love this outfit – you have great style and a great blog! gosto imenso das fotos 🙂 Os calções são super giros. É a minha cor preferida…por isso gostei ainda mais. those shorts are amazing! i absolutely love the print! This pics are so beautiful, I wonder what camera you use? Anyway, cute shorts & nice top, it's pretty!